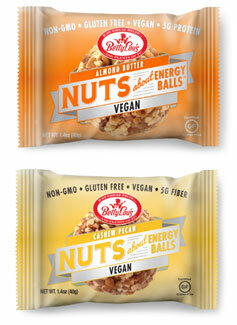 Satisfy your snack cravings and energize yourself naturally with these treats from Betty Lou’s! Made with tasty, satisfying ingredients, these snack-size Energy Balls are packed full of protein, healthy fats, fiber, and energizing nutrients to help you get through the day. Great for taking to work, the gym, on hikes, or anywhere else! Wheat & Gluten-Free. Available in two varieties: Cashew Pecan, or Almond Butter. Each 1.4 oz. (40g) ball is $1.79. Allergen Contains tree nuts and sesame. Manufactured on dedicated gluten free equipment that also processes peanuts, tree nuts, soy, egg, and milk.